In the distance, the sun sets in for the night to come. It was about 6.30pm in the early September, 2013 and I had just had my dinner – the not so comfortable dinner I had. The boat rocked side to side, and I was trying my best to keep my balance. It was not a luxurious boat; it had neither air-conditioner, nor comfortable separate beds to sleep. Just a simple wooden fisherman boat, with a small kitchen/dining room, an engine room, captain’s deck, and sharing the captain’s deck was a wooden bed, which is just above the engine. The bed could fit about six or seven people and it was also a place where we put our bags. Because it was just above the engine, imagine the heat, the smell, and the noise. Afternoon time was best to be spent outside. I was told that the toilet was functional; not really. Literally, it was just a very small room with a toilet bowl in it and that was it. I couldn’t flush it, no pipe water (well, obviously, because we were in the boat), and there was this rusty sliding door. It was hard to close, and it was almost impossible to slide it open. I had been avoiding toilet as much as I could. The first time I needed to use the toilet was sometimes in the afternoon on the first day in the sea. Despite some difficulties, I actually closed the door, living a small opening to allow my hand to push it open later (or so I thought). And in that eerie, dark toilet, I eased myself with my arms spread wide apart on the wall to keep my balance because there was no handle bar or anything to hang on to. Once done, I pushed the door open, but the door would not budge. I lifted, I pushed, and pulled, nothing worked. I think I was a little panicky that time. ‘This is not happening…oh God…this is not happening.’ I said to myself, almost praying. I could ask for help, but I was too embarrassed to do it, because… it was embarrassing. I could be a joke. Few minutes without success, and nobody seemed to notice…I finally let it out. ‘Uh…hello…Could…you…help to open…this door?’ Slowly I allowed embarrassment to sink in. I could feel the laughter, though none of them laughed at me. It was in my head. One of the guys helped to open the door. He pushed, could not open it, second push, not a budge. “Hey, help out here…she can’t get out.” The guy yelled out. Clothes and clothes pegs would be a better ‘door’ than a rusty wooden door. I thought. Being the only woman with the other seven men was intimidating. Not that those men were bad, I just did not have the advantage to do some of the things they could do. Example – shower. The guys shower in the open, changed new clothes the next day. I did not shower and I wore the same clothes for three days. On the bright side, I got to know life in the boat, to be in the middle of nowhere. At night, when the darkness overcame the surrounding, all you hear was the ocean. It was weird though, how I got here in the first place. Why I let it happened? Why did I leave the comfort of my home to the sea and fish with a bunch of men? Adventure – yeah, I wanted the experience, and it was one of the best experiences I had, although I did not expect anything such as, a stuck door. Since that incident, I drank less water to avoid toilet, at the same time, making sure that I would not get dehydration. I was amazed too that I did not have any bowel movement for three days. It was both a good thing and not a good thing. 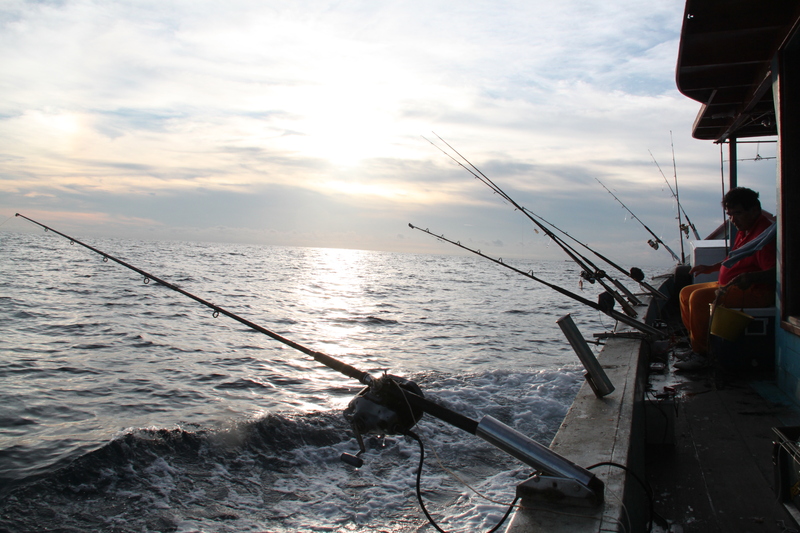 Seasick started to kick in as soon as the boat made its first stop for the guys to fish. The seasick pill I took 30 minutes before I left for sea, well…I guess the effect wore off. Hold it…hold it…no…not now…not happening…. 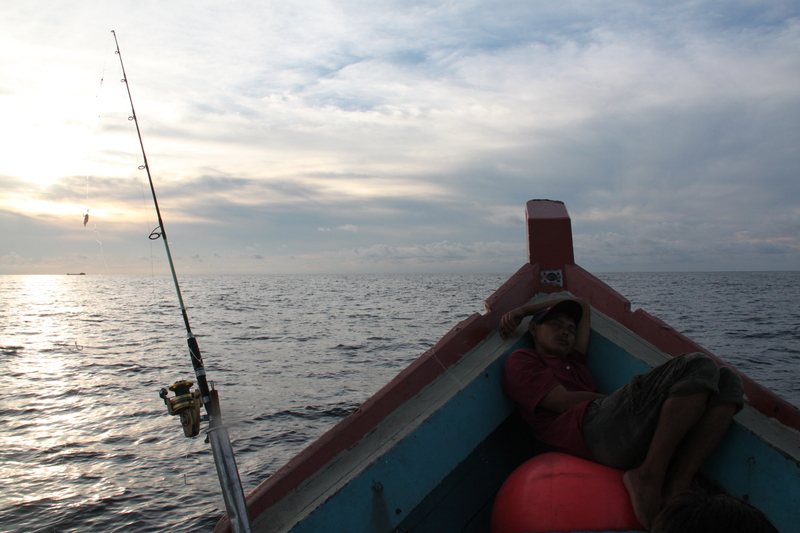 Then I rushed to the side of the boat, and everything I ate that morning went to the open sea. “There…there…that’s good…you’ll feel better.” Peter said to me. Peter was the one who invited me for an adventure. He called me up a few days earlier and talked to me about the plan, convinced me about the excitement and the adventure that I was going to expect. I went with him, after getting consent from my parents. Peter’s words were very comforting, in a way. Somehow, I felt very well taken care of. Before the trip, he told me that would take care of me throughout the trip, and he did, in fact, he was like a father, so I was pretty grateful. Though seasick was common, Peter told me he never had experienced seasick before. Seasick wasn’t that bad after all; it gone few minutes later and Peter taught me how to fish. 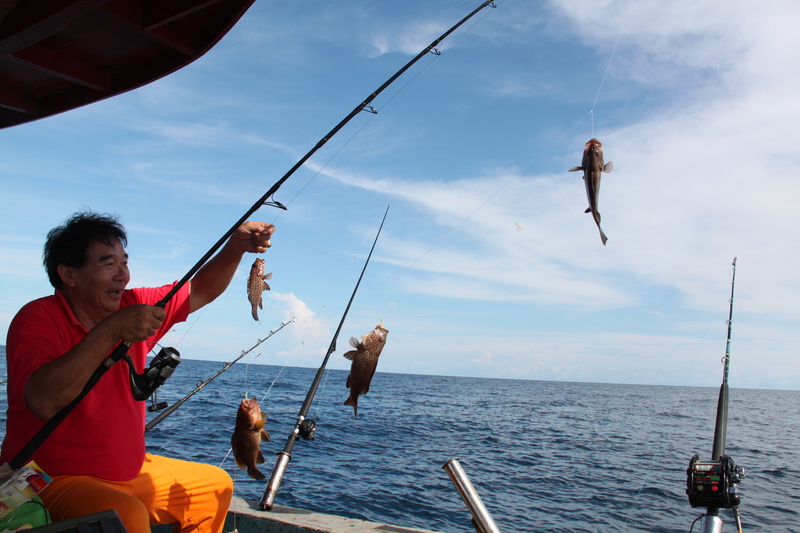 I’ve never thought deep sea fishing could be this fun. They were heavy, and hard work. With my small body, I needed more than might upper body strength. I used all the strength I had in my body to pull them up. Once in a while, I needed to catch my breath, and despite with sore arms, it was fun. 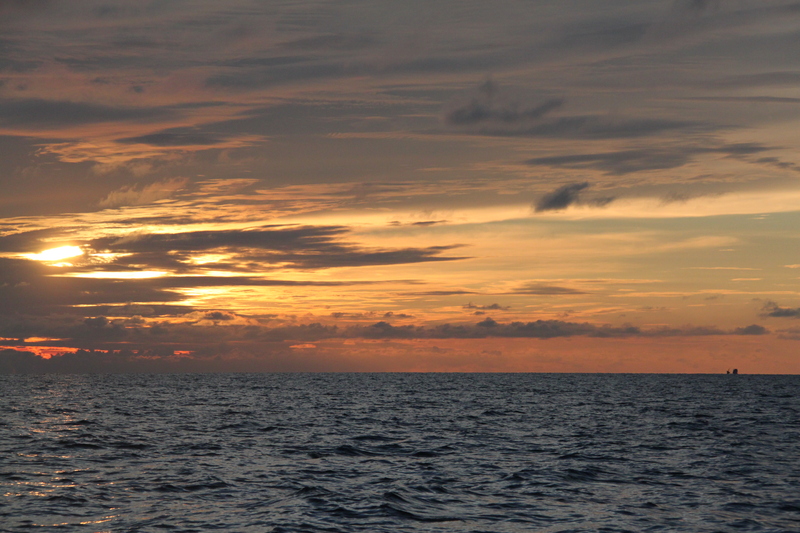 One of the things I’ve always look forward at the sea was the sunset. I was expecting something like orange and red colour ball in the distance. Due to bad weather, the sun was behind the cloud all the time. But, it was still beautiful nevertheless. 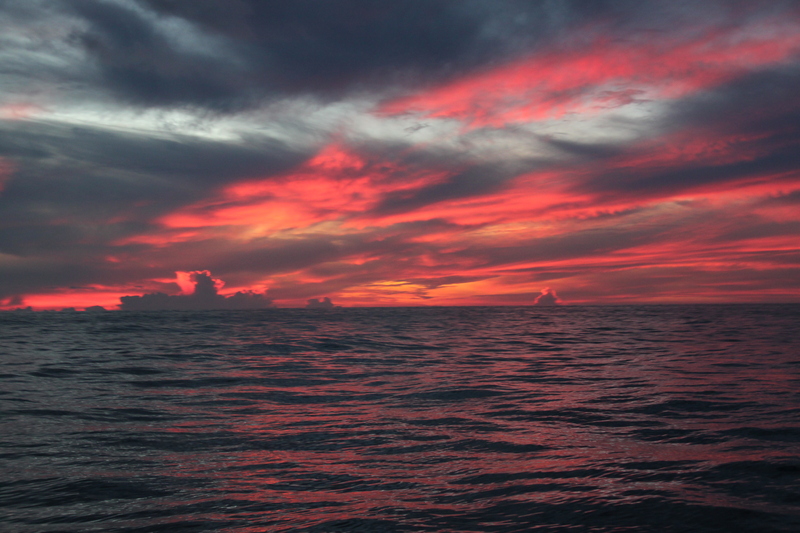 The red sky reflecting on the open sea…it was worth the trip. A lost bird kept returning to the boat. 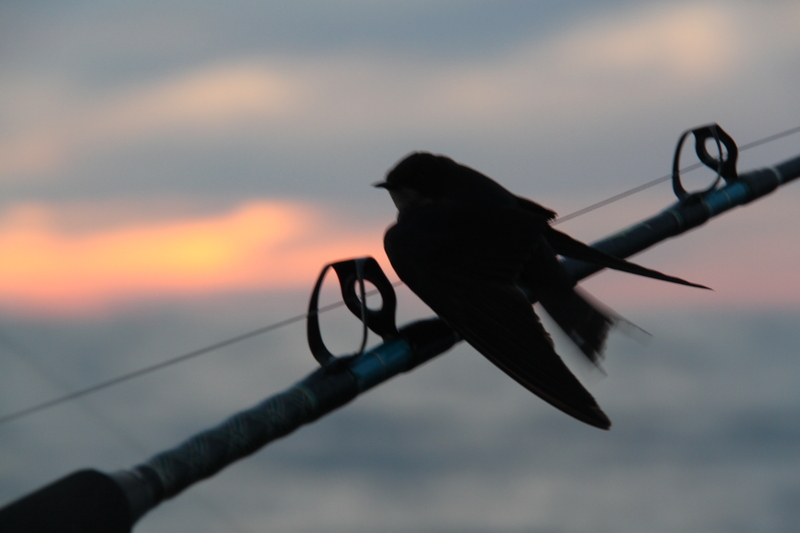 Tired, lonely, and desperate to go home – the crew told me that the bird would die anyway. I felt so sorry for the bird because there was nothing I could do to help it. I picked it up, I’ve never picked up a bird before, but I picked it up with great confidence and I patted it, I stroked it. And that was all I could do. It could survive, but it got off track from its flock. Now, the bird is nowhere to be found by its friends. When I told my dad about going out to the sea, he rejected the idea, but lucky for me, mom was on my side. ‘If she wants to go…let her go’ she told dad. ‘It would be a great experience for her, let her see the world.’ Dad realised it was my own freewill and choice, and that was how I got his blessing. He was worried about my safety, especially, when it was during rainy season. 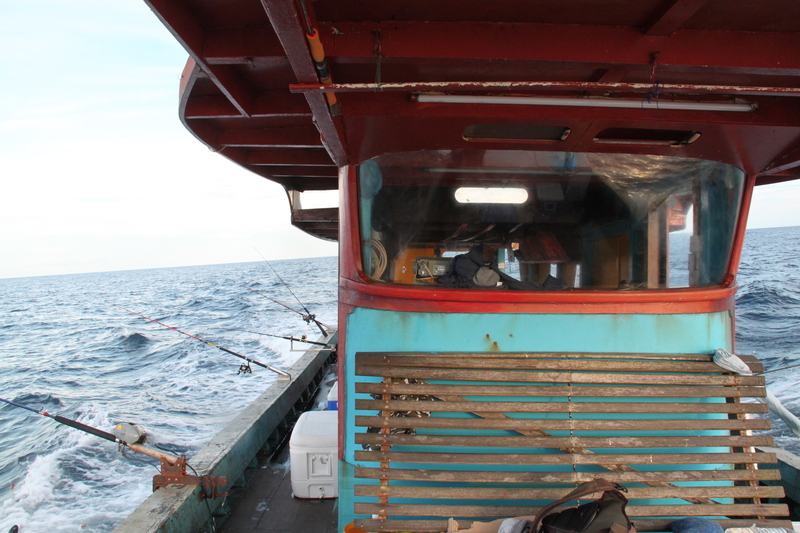 Rainy season means rough sea – I was aware of the danger, but the adventure was too good to let it go. I’ve never been to the sea in my life. I needed that experience. It was an experience I would not forget. I went to the sea with only my camera bags and a backpack. I came home bringing an ice-box full of fresh fish. The fish I helped to catch. I’ve never like fishing before, but deep sea fishing was fun, and been on the sea for three days was a great experience too. We were blessed with calm sea despite the rain. I was thankful for that. I didn’t shower for three days, lucky for me, I didn’t sweat a lot for three days either and, not to forget, I got stuck in the toilet. I felt so stupid inside that toilet. One of the crews actually kicked the door open when all methods failed. It worked, and I finally came out to the fresh air. I would never want to be stuck in the toilet in the future, but I think I would need the sea again.